Samaritan Health Clinic provides free medical care to Pickens County, SC. The Pharmacy provides life-sustaining medications. We do not stock any controlled medications. A GYN Clinic is held Thursday mornings each week. 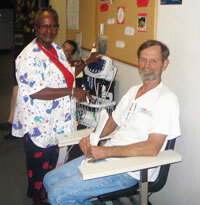 Women receive free pap smears, mammograms, and breast exams.